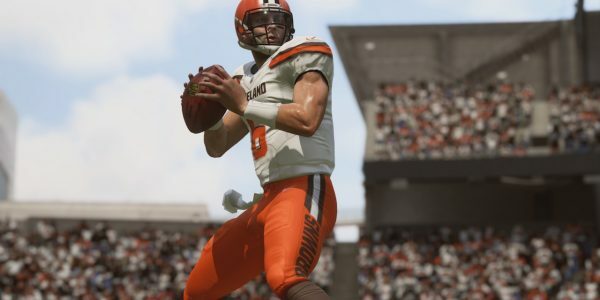 After an exciting Week 12 in the NFL, there is a Madden 19 player ratings update in store for gamers. A number of players came up big in their games over the past week. That included Thanksgiving Day matchups or Sunday games. Among the stars of the game were Chicago Bears’ defensive star Eddie Jackson and Cleveland Browns’ quarterback Baker Mayfield. Here’s a look at who got some boosts and who saw their ratings slip a bit. One of the star performances in Week 12 came during the Chicago Bears’ visit to Ford Field. In that Thanksgiving Day game, the Bears were able to get key defensive plays. One of those came courtesy of safety Eddie Jackson. He picked off one of Lions quarterback Matthew Stafford’s passes and returned it for a crucial touchdown. With quarterback Mitch Trubisky watching from the sidelines, the Bears ended up taking the game by a touchdown to keep control of their NFC North division lead. That netted Jackson a nice boost of two points. His Man Coverage went up by three points, with his Zone Coverage, Precision, and Awareness each up two. Also moving on up is the Cleveland Browns’ Baker Mayfield. The No. 1 draft pick was 19-for-26 as he tallied 258 yards and a whopping four touchdowns in a road win against the Cincinnati Bengals. Mayfield also avoided getting sacked and had zero interceptions for the game. That bodes well for the team’s future. Find out which players' ratings went up with the Week 12 roster update! His Madden 19 player rating is now at an 83 overall with a three-point surge for the rookie’s Awareness (now a 77). As they note in EA’s report, Mayfield has looked good with 13 touchdown passes and just two INTs over the past five games. At this point, it’s still early, but Cleveland may be patting themselves on the backs for making Mayfield their No. 1 overall pick. A third player under the spotlight in the Madden game is the Dallas Cowboys’ wide receiver Amari Cooper. As EA Sports noted, Cooper is getting a player ratings boost after his performance in the Thanksgiving game. He came up big for the Cowboys there as they defeated the Redskins. Dallas also scored an upset win over the New Orleans Saints in their Week 13 NFL game last night. Due to Cooper’s monster game against Washington, his Madden 19 overall rating is up to an 87 overall thanks to a three-point boost for Awareness (88) and a point on Catching. He started off the season as an 85 and fluctuated between that and 86, so he’s clearly on the rise. The ratings adjustments aren’t so kind for players who aren’t playing to their potential. That includes the Jacksonville Jaguars’ Blake Bortles. The Jags QB had a disappointing time on the field against the Buffalo Bills this past Sunday. The NFL rumors at the moment are that the team is going to look for a new quarterback for the future. Keep in mind, Bortles and the Jags were nearly in the Super Bowl last season. Due to his dismal performance, Bortles is benched for the team’s upcoming game against the Colts. In the Madden 19 game, he’s dropped to a 77 overall, with his Awareness down two points, and other skills ratings down a point apiece. Also sliding this week were the Carolina Panthers receiver Greg Olsen and Washington Redskins free safety Ha Ha Clinton-Dix. Olsen is now down to a 91 overall based on his past few games. As EA indicates, a lot of his poorer results this season could be due to him not being 100 percent after early injury issues. As for Clinton-Dix, the Redskins were hoping for improved defense with that trade. It’s believed he’s still getting used to the new defensive scheme. However, his Madden ratings are down a point to an 86 overall based on his poor defensive play against Dallas last week. Get more of the latest news about the popular football game through our Madden news section!